According to The Emporia Gazette, Austin Schopper, an English teacher at Waverly High School in Kansas was suspended right before Banned Books Week, for suggesting The Absolutely True Diary of a Part-Time Indian as an addition to his curriculum. The suspension is set to last nine days and will begin on September 11th. While the way the school is handling this seems unorthodox, the book in question is one of the most frequently challenged books. 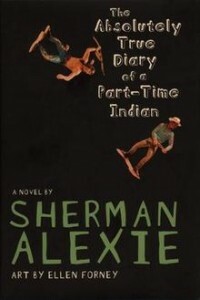 According to the American Library Association, The Absolutely True Diary of a Part-Time Indian by Sherman Alexie, was the second most frequently challenged book in 2017. That same year, CBLDF defended Sherman’s partially illustrated memoir in four different challenges around the country. Schopper also said those issues were what drew him to the book in the first place. He taught it previously at another school, and thought that students would connect with it. Previously he had also taught Me, Earl, and the Dying Girl by Jesse Andrews, which he believes can be considered controversial, and had great success with it. The superintendent Corey Reese said that he was unable to address this issue in anyway when the Gazette followed up with him.